Occasionally slashes the air with a (non-damaging) fiery cleave. Burn for 78 additional Dragonkin damage per round for 4 rounds. Poisons the enemy team for 118 Beast damage every round for 2 rounds. So this is interesting. I get this pet every other week running Firelands, no biggie, but it dropped from an armor cache that I got as a follower bonus reward...I thought it only gave equipment for followers, didn't know they dropped pets! I am thinking it may be a fluke? Pooder is correct. The drawback is that any pet with Sandstorm causes these moves to be almost useless. 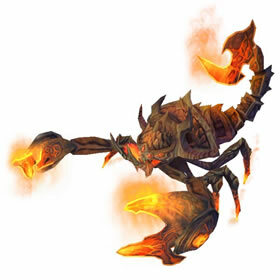 Great AOE pet for PVP. The P/B breed seems best. I like to start with 'Adrenaline Rush' to outpace most pets including flying. Then you can use 'Great Sting' for additional AOE, or 'Shell Armor' for additional protection. Then just 'Cleave' away. By using 'Adrenaline Rush' and outpacing your opponent, 'Great Sting' and 'Shell Armor' will last for 3 rounds instead of 2. Combined with the racial 25% damage buff this is a great AOE pet. During his time in the Firelands, Fandral would often grow bored and work shaping magic on the local flora and fauna.